My biggest problem with compliance interpretation in internal audits is that interpretations vary widely. Sending someone to a 5 day internal auditor course does not prepare that person for the myriad of interpretations that arise in a typical audit. I suggest you take a read through https://elsmar.com/ubb/Forum13/HTML/000054.html for some insight on opinions regarding internal auditing. If your situation is that of internal auditor, your company should choose a method which suits your company. 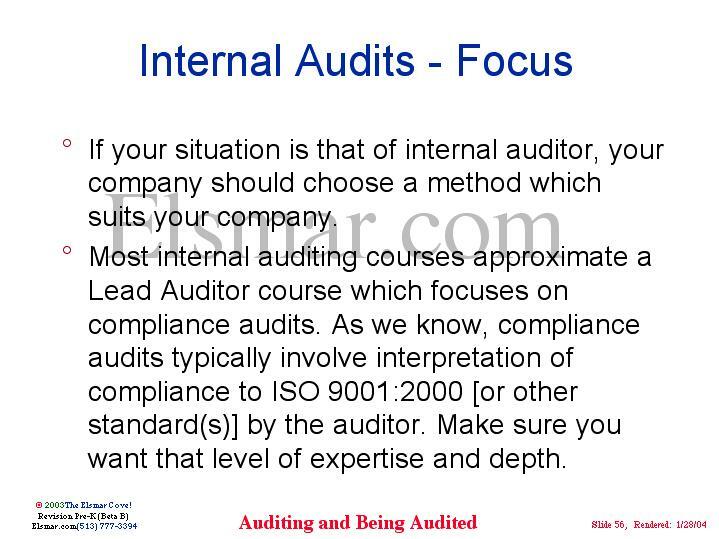 Most internal auditing courses approximate a Lead Auditor course which focuses on compliance audits. As we know, compliance audits typically involve interpretation of compliance to ISO 9001:2000 [or other standard(s)] by the auditor. Make sure you want that level of expertise and depth.